While we've seen Tye Sheridan and Sophie Turner as Young Scott Summers and Young Jean Grey in set photos for X-Men: Apocalypse, we have yet to see the two popular Marvel Mutants suited up in their new X-Men costumes. A new piece of promo art teases their updated look, as these students of Professor Charles Xavier engage in battle with an unseen foe. And we get to see Cyclops shooting his iconic beam of red light from his visor. While we don't get a very close look at the new costumes as envisioned for director Bryan Singer's next Mutant adventure, it appears that they are somewhat based on the suits worn in the current All-New X-Men comic book. The art is also interesting in that, while it depicts a devastated landscape, we do get to see a Pepsi sign that is clearly from the 80s, the time period in which this movie is set. 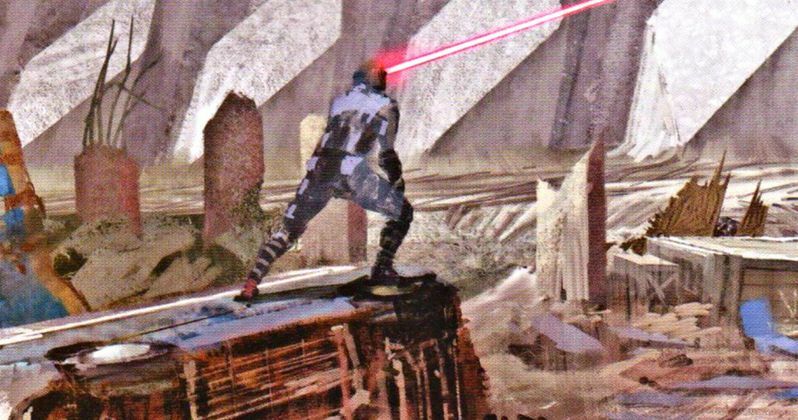 It's speculated that Jean Grey and Cyclops are fighting ArchAngel in this latest concept art. Played by Ben Hardy, he will become one of Apocalypse's four horsemen. It's also clear by this image that the 80s are going to get wrecked. While not too much has been revealed about the story, we do know that it will wrap up the trilogy that was started in 2011's X-Men: First Class and continued in last year's X-Men: Days of Future Past. Returning from previous movies are James McAvoy, Michael Fassbender, Nicholas Hoult and Jennifer Lawrence with new cast members that also include Lana Condor, Alexandra Shipp and Kodi Smit-McPhee. Take a look at this latest art, and let us know what you think!